Click on the questions below for answers to frequently asked questions about the Daniels Scholarship Program application process. 1. What is the timeline of the application? 2. Do I have to attend one of the partner schools listed on your website? No, the Daniels Scholarship can be used at any two or four-year nonprofit accredited college or university in the United States (scholars must intend to complete a bachelor's degree). However, there can be a financial advantage to attending a partner school for some scholars. Learn more about partner schools here. 3. Which email address should I use to register for the application? 4. I have forgotten my login information. How can I retrieve it? Please do not create a new account if you are having trouble getting logged in. If you are found to have multiple accounts, you may be deemed ineligible. If you cannot remember your password, please click the "Forgot Password" link just below the log in area. This will send reset instructions to the email you registered with. 5. When do I need to complete my FAFSA (Free Application for Federal Student Aid)? You will need information from your 2019-2020 FAFSA Student Aid Report (SAR) in order to complete the Eligibility Questionnaire, which determines if you are eligible to proceed with the application for the Daniels Scholarship Program. We recommend that you complete your FAFSA as early as possible. The 2019-2020 FAFSA will be available starting October 1, 2018. We also recommend that you submit your FAFSA online and provide a valid email address for electronic delivery. According to the FAFSA website, "it typically takes 3-5 days to process a [FAFSA] that was submitted online using FAFSA on the Web." If you provide an email address you will receive a link to your SAR via email. It can take much longer if you submit a hard copy of your FAFSA and/or request to receive your SAR by mail. If you wait too long, you could miss the Daniels Scholarship application deadline, so plan ahead. 6. How do I complete my FAFSA? 7. Who do I contact if I'm having trouble with my FAFSA? The Daniels Fund does not provide assistance or advice on how to complete the FAFSA. Please contact FAFSA directly by calling 1.800.4FED.AID (1.800.433.3243) or visiting their help website at https://studentaidhelp.ed.gov/. 8. When do I need to take the SAT/ACT? 1. What are the eligibility requirements for the Daniels Scholarship Program? You can review our eligibility requirements in the Eligibility section at scholarship overview page. 2. Is there a GPA minimum to be eligible for the scholarship? There is no high school GPA minimum to be eligible for the Daniels Scholarship. There are ACT/SAT test score minimums. You can review our eligibility requirements in the Eligibility section on the scholarship overview page. 3. My parents are residents of different states from each other or from me. Does that affect my eligibility? To be eligible, the applicant must be a legal resident of Colorado, New Mexico, Utah, or Wyoming and must also be graduating from a high school in one of those four states. Residency of parents or legal guardians does not affect eligibility. 4. My parents are not citizens of the United States. Does that affect my eligibility? To be eligible, the applicant must be a citizen or permanent resident of the United States. Residency of parents or legal guardians does not affect eligibility. 5. I have made an error on the Eligibility Questionnaire, but have already submitted it. What should I do? 6. Why didn't I pass the Eligibility Questionnaire? Upon submitting your information, you should have been directed to a page, and received an email, explaining why you are not eligible. 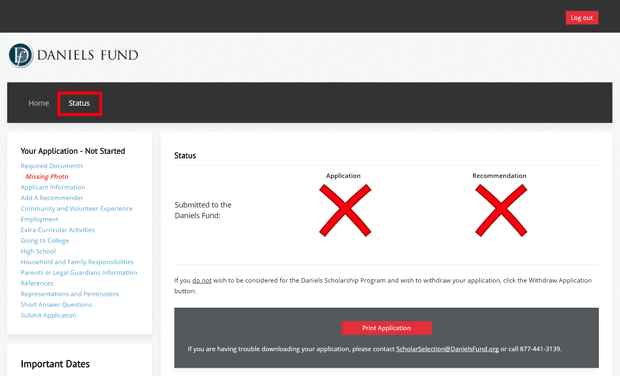 You can review our eligibility requirements in the Eligibility section at DanielsFund.org/Scholarships. 1. What is the difference between a reference and a recommender? You will need one recommender and two references to complete your application. Your recommender will need to register for a recommender account and complete and submit a recommendation for you through the application website. They will also provide their contact information and answer a series of questions about you. Your references do not need to submit anything to Daniels Fund or take any action associated with your application. You will provide their contact information and we may reach out to them during the application review period if we have any questions for them. Not all references will be contacted. 2. How does my recommender submit their letter of recommendation? Within your application, you will designate a recommender and provide us with their email address. Once you save your recommender information, they will receive an email with instructions on how to create a recommender account, log in, and complete a recommendation of you. It is your responsibility to ensure that your recommender submits your recommendation by the application deadline. Emailed, mailed, or faxed recommendations will not be accepted — they must submit through the application system. 3. What do I do if my recommender hasn't received their notification email? At any time, you can have the email re-sent to your recommender by going to the recommender page of the application and clicking the Resend Recommender Email button. There is also an invitation code on the Add a Recommender page which you can share with your recommender. This code will allow them to access the recommendation page for your application. 1. How long do I have to complete the application? The application is open between October 1, 2018 and November 29, 2018 at 4:00 p.m. MST. Once you start the application, you can save your progress and resume at a later time. You may take as long as you need before the deadline to complete and submit your application. There is no advantage to submitting early. However, as it gets closer to the deadline, there is a higher volume of requests for assistance, and Daniels Fund staff may have less capacity to assist you quickly with any issues or questions. After submitting, you may go back into your application, make changes, and resubmit, at any time before the deadline. The application website will automatically log you out after four hours of inactivity in a session. 2. How do I ensure my application answers are being saved? You should save your work often by clicking the Save button to avoid any loss of data. In addition, the application website auto-saves your responses in any given field as soon as you click out of that field. A good practice is to work on your short answer answers in a Word document or other program, save them, and then copy and paste your answers into the application. Once you complete your application, you will be able to download a PDF of your full application containing all of your answers. 3. How do I check the status of my application? You can review the status of your application by visiting the Status tab within the application. 4. What restrictions are there on file uploads? The application website will allow documents up to 200 MB to be uploaded. You may upload Word documents, PDFs, and standard image file formats. 5. I am not comfortable uploading sensitive personal or financial information. What options do I have? 6. The application is asking for a document that I don't have. What should I do? 7. How do I submit my test scores to the Daniels Fund? You will upload all requested documents through the application website. The Daniels Fund does not have a 6-digit organization code for you to enter on your ACT or SAT test to have scores sent electronically. We do not accept scores by any other method other than uploaded through the application website. 8. What if I do not have eligible scores in all sections of my ACT or SAT yet? You must have eligible scores in every section of your ACT or SAT from one test date by November 29, 2018 to be eligible to apply. We do not accept late scores or scores you believe you can achieve next time, nor do we accept super-scoring. The scores you enter into your application must exactly match the score sheet you upload. For full details on the score requirements, you can review our eligibility requirements in the Eligibility section at scholarship overview page. 9. What is super scoring? Super scoring is when you take the highest scores from different sections of tests taken on multiple days to compile the highest scores you've received. We do not allow this — all scores must come from one individual test date. 10. Can I attend a school that I didn't list on my application?